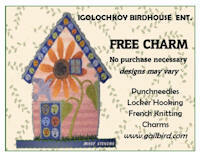 Our website is devoted to Igolochkoy™, the Russian Punchneedle. Supplies, Patterns and Kits for Punch Embroidery. In our on-line store you will find everything you need. We carry a large Inventory of Books, Iron-On Transfer Pattern Books, Kits, Patterns, Supplies, Charms, Gifts and other Needlework related Art and Craft Supplies. If you need a specific product e-mail us. 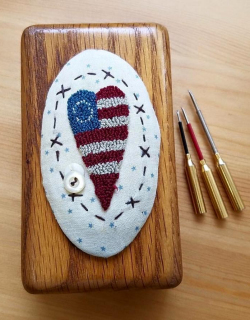 Gail's Tips and Tricks page will show you how to punch and how to place the fabric in your hoop. Gail is adding Tips continuously, so check back often. Gail travels all the time, all over the world, so check out her Show Schedule and catch up with her when she is in your town. Gail teaches at all the Shows, either seminars, workshops or make-it take-it's at her booth, so be sure to stop by and see how easy it is to "get loopy"!